Wishing my patients and friends Merry Christmas for those celebrate it, and Happy Holidays for those who don't. 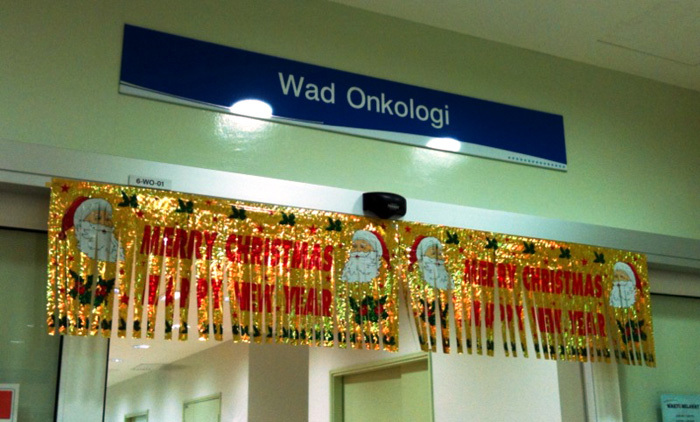 I noticed this rather festive banner in front of the Palliative Ward and it hit me that tomorrow will be a holiday. When I was working in the UK, Xmas was the time when I was definitely on call since I'll be covering my colleagues who were celebrating. The actual Xmas Day was usually quite but the days leading up to it and the days following were usually among the busiest in the year. Relatives would send their parents and oldies to be admitted while they enjoy the festives period and at times it felt really sad that the system has been manipulated somewhat. The days after Xmas were usually busy for the right reasons as patients tended to stay at home during the Xmas and came to hospital right after. They tended to be more ill by this time. I used to hate this period. Luckily I will be having the weekend off. Will be traveling tomorrow to Kuala Kangsar for a couple of days, having a look at Puan Anita's house there which was just been built. Will blog from there then. Again, Happy Holidays.